Creatine Monohydrate also offers therapeutic benefits, including the prevention of ATP depletion, stimulation of protein synthesis and cell volumization. Creatine Monohydrate is the undisputed king of Creatine. Over 95% of all research ever conducted used Creatine Monohydrate. Other forms of Creatine have come and gone, all trying to make the claim that they have improved the original Creatine. The truth is that very few, if any, scientific studies are even being attempted to try to prove that they enhance performance in any way. 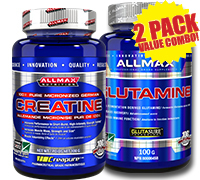 ALLMAX Pharmaceutical Grade Creatine is the ultimate in purity and safety; rigorously held to strict standards that meet or exceed 3rd-Party independent testing for WADA Banned Substances and cGMP guidelines. In addition, our Creatine is micronized to an ultra-fine, free-flowing powder. Most Creatine powders on the market today have particles that are as much as 250% larger! Warnings: Do not take if pregnant or lactating. Do not take if currently taking any prescription medication or receiving medical treatment without consulting your physician. Keep out of the reach of children.